Fast Food News: McDonalds Taking Advantage of the Mathematically Challenged? McDonalds Taking Advantage of the Mathematically Challenged? Hmmm? 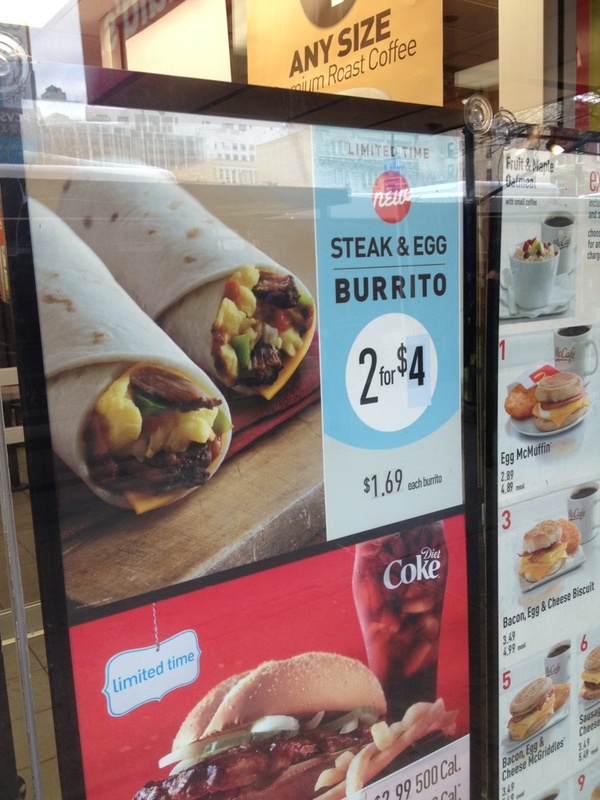 Steak and Egg Burrito, 2 for $4. Small print: $1.69 each burrito. And if you did happen to know that $4 is more than $3.38, and that you weren't getting a bargain by buying 2, but you wanted 2, how would you order. Would you need to make to separate orders to get the $1.38 price?!?! A mystery for the ages. If you purchase them individually you will actually pay more because of the sales tax. But it doesn't apply for people who live in a non tax state. Clearly there is a sticker/paper covering the original price. It looks the original price was "2 for $3"